What is God Calling me to? Working out what God dreams for you, is a wonderful adventure. As with all adventures, the journey has different stages, and if it’s a physical journey that can also be different depending on your age and level of preparedness (or fitness!). Since the moment you were conceived, God had a loving plan for you, just as many good parents would have, God has a dream for you… and also as many good parents would say, even if you don’t follow his dreams for you, you will still be loved unconditionally as his child. The first part of God’s dream for you is love. He dreams that you will be born into love, feel loved and nurtured, and eventually turn into a loving being yourself. He Calls you to Love. As we all know, we live in a world which is wounded by sin – by imperfection and frustration… but the mystery and power of God’s action in the world means that some way, some how, God will in the end make it all right. This is what we learn from the resurrection of Jesus after he was crucified. As we continue on this journey, we learn that God also calls us to be like his Son, Jesus. This means we are called to the same mission as Jesus – to bring about the Kingdom of God, “on earth as it is in heaven,” just as we learn in the Our Father prayer Jesus taught us. How we bring God’s Kingdom here on earth, can then depend on more specific ways of life. Some men are called to be priests or deacons, for example. Some people too, might be called to consecrated religious life. Most of us are called to get married and start a family, or even to remain single and serve the Lord and his church in that way. 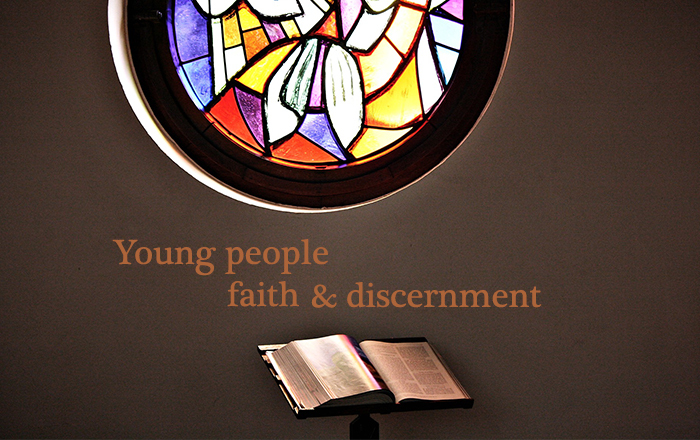 Pope Francis invites all young people, to learn how to discern what God calls them to. Discern means to prayerfully question deep inside yourself. It’s like tapping into a sense that you might not be used to using, so sometimes it can be helpful to get some help or advice on how to do this. There are many books you can buy to get you started, but if you feel you need more help, you can ask somebody who has experience in this. This might be your parish priest, or a local religious brother or nun that you might know, or you can ask around if there are any trained Spiritual Directors. If you wish, you can ask one of the Sisters in our Book Centres for advice on this.